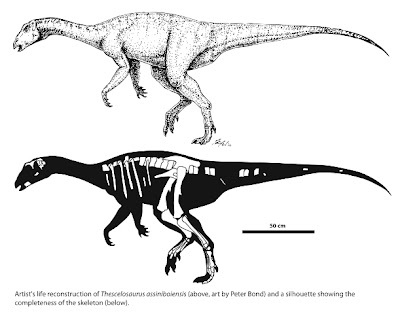 Abstract : A small, articulated basal ornithopod skeleton from the Frenchman Formation (late Maastrichtian) of Saskatchewan, previously referred to the taxon Thescelosaurus, differs from both recognized species of this taxon (Thescelosaurus neglectus and Thescelosaurus garbanii). We recognize this specimen as the holotype of a new species, Thescelosaurus assiniboiensis sp. nov. Identification of a third species of Thescelosaurus from the late Maastrichtian of North America suggests that this taxon was more diverse than previously recognized, and shows an increase in diversity from the Campanian through the late Maastrichtian, contrasting the trends seen in most other ornithischian clades.